How Can I Go A Brownie Affair? Where is A Brownie Affair in Lake Ronkonkoma on the Map? "A Brownie Affair" created cake pops for my bridal shower. There were bridal gowns and tuxes and they were absolutely ADORABLE!! Every last detail was done beautifully and artistically. In addition to the way the pops looked, they tasted ABSOLUTELY AMAZING!! I had several guests tell me how much they enjoyed the pops after the event. The owner is a delightful person and great to work with. I will definitely be ordering from "A Brownie Affair" again in the future and if you order, I assure you, you will NOT be disappointed!! 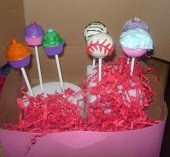 The first time i tried these cake pops was at my friends baby shower and I wanted more and more. I had to order them for holidays. A Brownie Affair Cake pops are to die for. They are EXTREMELY delicious, moist and decadent. The chocolate brownie was the best thing I have ever had in my life. I strongly recommend it. The service was great, I received my pops as scheduled and the price was better than anywhere i looked. ]Thank you "A Brownie Affair" my family and I will be ordering a lotttttttt more soon. Bought some pops for my lady for Valentine's Day and not only did they arrive ON TIME but were perfectly individually wrapped and displayed nicely. My girl passed them around at work and her co-workers said they were amazing. She brought one home for me to try and they were so good I had her grab me another. The taste was splendid, the brownie was moist and fluffy and had great rich flavor to it. Perfect for a special treat. I highly recommend buying these for yourself, someone else, or a special occasion. Also, the best part about this … is who makes them. You can tell these were hand made with lots of attention to detail, high quality ingredients, and above all else … LOVE! I ordered from "A Brownie Affair" for my Oscar's Party. When I first reached out to them I kind of had an idea of what I wanted but didnt know how to articulate it. Within minutes I was offered three awesome options! It was absolutely amazing!!! Customer service was great! I cannot wait to order again!